Fifty miles east of Miami in Florida, USA, lies the westernmost district of the Bahamas: Bimini, a small archipelago encompassing two main islands called North and South Bimini, as well as several cays. Perching on the ridge of an enormous underwater cliff, off the west coast, Bimini is renowned nationwide as the ‘big-game fishing capital' thanks to the deep-waters roamed by tropical species like wahoo, marlin and sailfish. 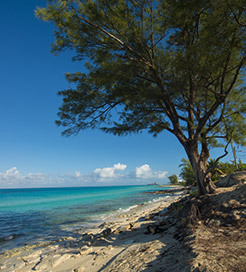 The shallower shores benefit hugely from the warm Gulf Stream, providing the ideal environment for vividly coloured coral, schools of manta rays and pods of dolphins, making Bimini a sub-aquatic paradise. Moreover, divers can marvel at a sunken ship built by Henry Ford during World War I, or delve into the fabled Lost City of Atlantis, close to North Bimini Island. This particular region of Bimini also boasts the finest beaches, all with dazzling white sand stretching all the way up from Alice Town to Bailey Town. A guided tour of the Bimini Nature Trail is a must, offering numerous chances to explore the variety of endemic animals, including the Bimini Boa, and fascinating plants species. But one of the most popular sites in Bimini is the Healing Hole, a natural pool pumped with lithium and sulphur-infused sea water, once believed to slow the human ageing process. It’s no wonder, then, that so many historic figures have navigated the turquoise waters here from the United States. Firstly, the islands served as a safe haven during the prohibition for rum-lovers, then Ernest Hemingway fell in love with its golden coastline in the 1930s, calling it his summer home. Additionally, Martin Luther King composed sections of his Nobel Peace Prize acceptance speech while sailing the coast in 1964; the bronze memorial of whom is one of the top tourist attractions in Alice Town. Ferries link the Bimini Islands with Florida, USA, with a few weekly crossings from Miami to North Bimini, usually lasting just a couple of hours. For more information, please visit our Ferries from United States to Bimini Islands page.